The last in a five-part series leading up to Mennonite World Conference Assembly in Harrisburg, Pa. When someone asks you to use a few words to describe yourself, what words do you use? Would you change those words to describe yourself when you are with your family? At work? Travelling to some distant place? I discovered that the words I use to describe myself change, depending on my cultural context. When we lived in Toronto, the two most basic words I used to describe myself were “Christian” and “woman.” Those were the two parts of my life that made the most difference in how I lived. Imagine my surprise when we moved to southern Africa and those words didn’t really matter as key parts of my identity. Everyone we interacted with defined themselves as Christian, so that was taken for granted; it was far more important that I was a mother than that I was a woman. In southern Africa, the most important thing was that I was white—an aspect of identity I had taken for granted in Canada. A Christian woman—those were the important parts of my identity in Canada. A white mother—those different parts of my identity became the most important in Lesotho. My self-understanding of my identity changed, even though I had not changed. This change illustrates the first point I want to make: Culture matters, because culture defines who we are. Secondly, language matters. I have learned a little bit of several languages and I am fascinated by words that exist in one language and have no direct translation into another language. In Sesotho I learned that there is actually a word for a body part that heals badly after a break or a wound—we have no such word in English. And in Spanish and French there is the lovely word “animateur” or “animador,” someone who plays a facilitating and encouraging leadership role in a group of people, a concept that just does not make it into English. And in German we have the lovely word “gemeinschaft,” a word that English speakers have translated into “brotherhood” and “community,” though these translations fail to capture the depth of meaning that word has in German. Each of these examples underscores the fact that language matters, because language gives us the concepts that are important in our culture. There are some deep differences among all our various languages and cultures around the world, differences that go far deeper than we sometimes realize. Culture, shaped by language, impacts our worldview, our self-understanding and our sense of identity. And this is particular challenging for Christians, whose beliefs and practices are shaped by culture and language even though our faith transcends those categories. There are many biblical images and stories that show us how these differences can in fact be part of God’s plan for building the church. The theologian Walter Brueggemann says this is a story of people who wanted to be great because of their cookie-cutter sameness—same language, same food, same clothes, same culture. There is a lot that can be accomplished in a homogeneous culture. Brueggemann suggests that God scatters the people to show them a better way. The unity God wants for the human race is diverse people drawn together by common faith and values, not drawn together by sameness in language and culture. The creation of many languages and the scattering in this story are not a punishment, but are actually an opportunity to live up to the much greater potential God wills for the earth, he says. God gave the people of the Tower of Babel the opportunity to experience difference in order to learn to depend on God and to be drawn together through faith rather than through culture. It takes a global village to be who God wants us to be. Another biblical image of difference occurs at the other end of the Bible—in the last book. In Revelation 7: 9-14, we read about an uncountable number of people, from every nation, every tribe and every language, all singing and worshipping God together. This is the opposite image to the Tower of Babel. This is a little glimpse of heaven! This image comes to us as part of the story in Revelation of the opening of the seven seals—seven events with terrible consequences for the people. This image is actually in between the opening of the sixth seal and the seventh seal, like a little break in the story. Here we have this picture of the people of God from every culture and language, together worshipping God, regardless of the ordeals, persecutions and tribulations that they are experiencing. A question is asked in verse 13: “Who is able to stand in the midst of all these ordeals?” The answer is given in this image: it is the multicultural people of God who together worship and praise God from every country and every language, and who are able to stand throughout persecution and tribulation. It takes a global village to be the people God wants us to be, and to be able to stay strong through persecution. In Ephesians 3, Paul very directly states that once the Gentiles were not only foreigners and aliens but uncircumcised, and therefore not part of Israel, not part of God’s people. But now, he concludes, through Christ they belong—fully belong. Paul’s commentary was an immense shift in thinking for Jewish Christians. Only then could they begin to understand that there could be different ways of worshipping God than their own Jewish traditions, particularly the practices that gave them identity, such as circumcision and food laws. For those of us who think our ways of worshipping and understanding God are the right ways or the best ways or even the only ways, the image of God’s multicultural people in Revelation 7 is also an immense shift in our own thinking. It takes a global village to be the people God wants us to be. We are cultural people, and our own cultural traditions and languages are the means through which we understand and worship God. There is much to celebrate in many of our ways of worshipping and understanding God, wherever it is that we live and worship. But our own ways are not the only ways! Our ways are comfortable and familiar, and our leaders can even usually give extensive biblical explanations for why we think our practices are the right way. Like the people at the Tower of Babel, we are too often afraid that differences will create disunity and will scatter us. We are too often ready to depend on language and culture and tradition to hold us together, instead of depending on God’s ways to hold us together across our differences. It takes a global village to be the people God wants us to be. Having studied sociology, I know that every group works hard to create its own identity and its own way of doing things, and that those ways of belonging are important. We all want to belong to a group with whom we share identity; that is normal human nature. Belonging is a good thing! However, these stories in Genesis, Revelation and Ephesians help us to see that God intends for us to share our primary identity with other Jesus-followers, rather than with those who share our language, culture or nationality. We belong to a people whose worldview is shaped by God, the Bible, and our faith community. Our primary identity is as Christians. We belong to a local church and a global church. This identity and belonging should be the primary influence on who we are. Our congregations are places where we belong, where we know each other and where we enjoy similar styles of worship and following Jesus. Belonging to a local congregation where we like to sing the same songs or pray in the same way is a good thing. Many of us also belong to regional or national conferences—another setting in which we share customs and traditions that bind us together in common identity. Mennonite World Conference is different from belonging to a local congregation or conference. MWC is our global Anabaptist church community, where we come together because we share convictions and experiences of God, Jesus, the Holy Spirit and the church. It is our place to catch just a little glimpse of heaven on earth—a glimpse of what it is like to worship God together with a multitude of others from different nations, different cultures and different languages. It is a glimpse of being the people God wants us to be—a people bound together by more than language, culture or local customs and traditions. MWC is a place for us to learn from our cultural diversity about what it means to follow Jesus. I believe that we can best answer the question, “What does it mean to be an Anabaptist Christian in my cultural context today?” by finding out how people in other cultural contexts answer that question. 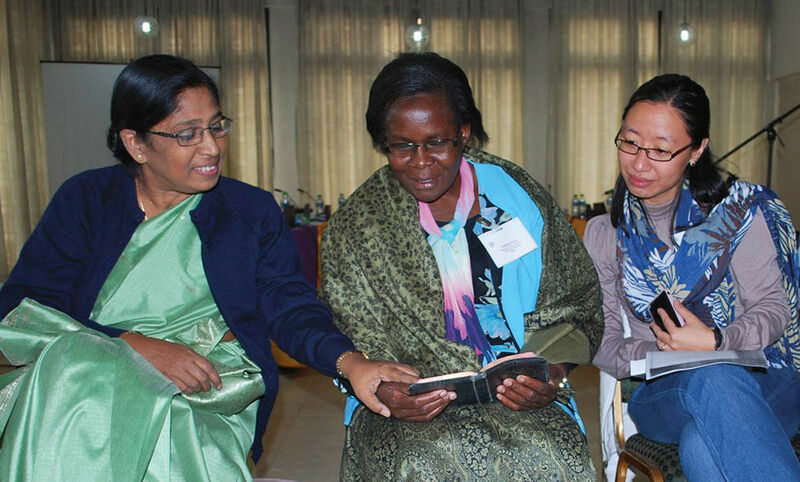 MWC is the place where we walk this journey of faith with others who are different from us—different cultures, different countries, even different types of Anabaptists in different conferences. MWC is the place where we are bound together by our shared convictions, experiences and relationships as Anabaptist Christians. Together, we are a bit of heaven here on earth. Together, we are strong enough to resist persecution and temptation. Adapted from an article that originally appeared in the April 2015 Courier. Arli Klassen of Kitchener, Ont., is the chief development officer for Mennonite World Conference and coordinator of MWC continental representatives. 1. What are your experiences of worshipping God in an unfamiliar culture? How have these experiences been uplifting? How have they been challenging? What role does language play in the relationship between different cultures? What factors make it challenging to translate from one language to another? 2. Arli Klassen says that our worldview and our sense of identity is shaped by our language and our culture. Why is this concept important to remember as we come in contact with other cultures? What problems arise when we assume that our culture is the right one? 3. Klassen suggests that unity based on sameness is a response to fear and leads to pride. Do you agree? How important is it to have exposure to other cultures? How does a mix of cultures help us develop a broader concept of God? 4. How important is it for Mennonite Christians from around the world to meet at Mennonite World Conference assembly? Do you agree that worshipping with a diverse group of Christians feels like a little piece of heaven? Are you hoping to attend MWC assembly next time around?